Don’t let the cost of dental care affect your health. Do you avoid seeing the dentist due to cost? According to the American Dental Association, about 1 in 5 individuals are unable to afford seeing a dentist even for the most basic dental care. The second most common reason individuals aren’t seeing a dentist regularly is dental care is not seen as an essential need. Since more and more people avoid seeing a dentist due to cost, and many do not see dental care as essential, trying to find a top dental clinic is low on their To Do list. The reality of avoiding simple preventative dental care such as regular checkups and dental cleanings, though, can end up costing more overall. When you avoid seeing the dentist for basic dental care, it can affect more than your bank account. It can affect your overall health. Let’s say you’ve been having tooth pain, but because you are concerned about the cost of seeing a dentist, you opt for over-the-counter pain relief. You take the pills and the pain may go away. Issues may arise when the pain returns and the OTC pain pills no longer provide you the relief you desire. You may even begin to experience sensitivity to hot or cold foods and beverages, pain that radiates to your neck or ear, a fever, and/or swelling of your cheek or neck. Symptoms like these can indicate something far more serious is taking place in your mouth which requires you to make your way to the emergency room. If you experience these symptoms, you may have an abscess with facial cellulitis, which requires immediate medical attention. If caught in time, the abscessed tooth can be cared for with antibiotics and a root canal, but if the infection has spread further it can be life-threatening. According to the ADA Health Policy Resources Center, in 2012, 2.2 million emergency department visits were because of advanced dental conditions such as the scenario above. Many of these visits could have been addressed before they became emergent if seen by a dentist. There’s a way to get the dental care you need without adversely affecting your overall health and your budget with a top dental clinic at Penn Dental Medicine! Penn Dental Medicine is an affordable dental school clinic that provides patients with the care they need at a cost they can afford. There’s no longer any reason to avoid preventative dental care because of cost, and you won’t need to tough out that tooth pain any longer either. Penn Dental Medicine is able to provide care for patients who need something as simple as a dental cleaning in addition to more complex dental treatment. As a teaching clinic, predoctoral and postdoctoral dentists rely heavily on their patients to aid in their success. When you come see us at Penn Dental Medicine, you get 2 dentists for the price of one, so to speak. Our student doctors will oversee your care under the supervision of faculty from the University of Pennsylvania’s School of Dental Medicine. 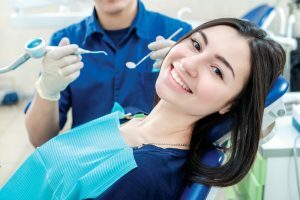 This means you get the care of an experienced and licensed dental professionals who know the latest and most advanced research and techniques for optimal dental treatment. Don’t let cost dictate your health! Contact Penn Dental Medicine to see how you can become a patient.